Today we're being a busy bee after a shopping and doing day yesterday (doing things outside of the house) so hence the feeling of housewifey-ness. You may have picked up on the fact that I'm actually never a regular cleaner so perhaps the above picture wouldn't really be accurate. The middle two scenarios would be the closest match I reckon. 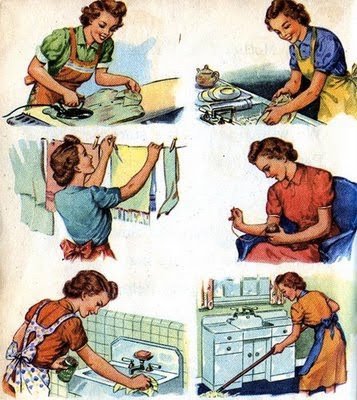 And of course the hair do's and the aprons in all, that's me for sure! Aprons just for being in the house I say! I'm curious to know if I were a stay at home lady, would I actually do these kind of things, or would I just wind up playing online computer games all day? Wow! That is quite the to do list. My no. 1 item on my to do list is getting organised to move out of home. 2 weeks from yesterday and we will be in our own place. I really need to get started on my packing. I have done 1 box so far. Love the song and pictures! And what a list! Can't wait to see the watermelon dress! Hey this is really very nice work and I am quit confused in searching for the daily work done by my mummy and finding the same idea from all mom. Thanks for this cute post and video.